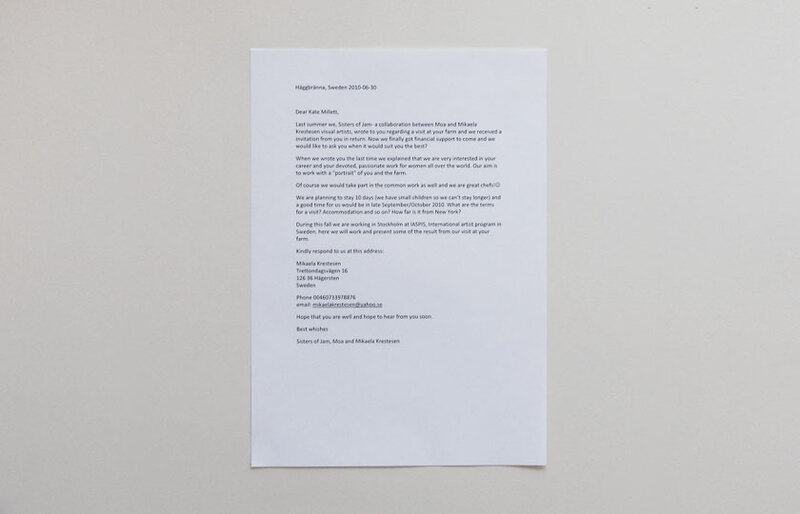 Last summer we, Sisters of Jam- a collaboration between Moa and Mikaela Krestesen visual artists, wrote to you regarding a visit at your farm and we received a invitation from you in return. Now we finally got financial support to come and we would like to ask you when it would suit you the best? When we wrote you the last time we explained that we are very interested in your career and your devoted, passionate work for women all over the world. Our aim is to work with a ”portrait” of you and the farm. Of course we would take part in the common work as well and we are great chefs! We are planning to stay 10 days (we have small children so we can’t stay longer) and a good time for us would be in late September/October 2010. What are the terms for a visit? Accommodation and so on? How far is it from New York? During this fall we are working in Stockholm at IASPIS, International artist program in Sweden, here we will work and present some of the result from our visit at your farm. Hope that you are well and hope to hear from you soon.